JULY 19, 2016 - Vishay Draloric’s Industry-First Thin Film Flat Chip Resistors, the TNPV e3 Series, are now available through New Yorker Electronics. 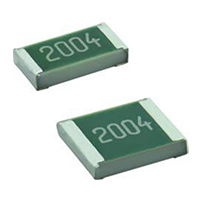 The industry's first such devices with operating voltages to 1000V, TNPV thin film chip resistors can replace larger resistors and multiple devices in similar case sizes. This minimizes board space and reduces costs in precision high-voltage circuits by replacing larger resistors and multiple devices in similar case sizes. The TNPV Series is available in both 1206 and 1210 size cases. The Vishay 2016 Super 12 featured resistors deliver low voltage coefficient, tight tolerances and low TCR for precise voltage measurement. They are ideal for most fields of modern electronics where the highest reliability and stability at high operating voltages is of major concern. The series features high operating voltage Umax. up to 1000V, TCR and tolerances down to ±10ppm/K; ±0.1% and excellent overall stability at different environmental conditions ≤0.05% (1999h rated power at 70ºC). Special high-voltage thick film resistors can also be replaced, which allows for significantly enhanced performance due to superior voltage coefficient and unrivaled precision properties at high voltages. With their excellent load-life stability, superior moisture resistivity, and sulfur resistivity, the resistors provide high stability in various environmental conditions. This allows designers to use the devices for most fields of modern electronics where precision, reliability, and stability at high operating voltages are primary concerns, including various high-voltage industrial, automotive, and lighting applications. Samples and production quantities of the TNPV e3 series resistors are available now at New Yorker Electronics, with typical lead times of eight to 10 weeks for larger orders.